Your Wedding Fairy Tale Begins Here! Catherine's Bridal Boutique has hundreds of bridal gown samples in stock for you to try on! We proudly carry styles from top designers, such as, Mori Lee and Maggie Sottero, as well as exclusive designs from on trend designers that you won't find anywhere else. Browse our inventory and let us know your favorites. Browse our beautiful bridesmaids gowns online and find the look that fits your vision and your budget. We welcome walk-ins, but appointments are recommended. We take appointments for any day of the week. Schedule yours today! Call (219) 462-7433 or schedule one online. Let us guide you through this very exciting journey. Here is what you need to know before you go shopping for your wedding gown. Welcome! Congratulations on your engagement! Whether you visit our store in Valparaiso, IN or shop with us online, We can help you plan the wedding of YOUR dreams. Brides, Bridesmaids and Mothers of the Wedding will find helpful, practical advice here. Together, we have over 30 years of experience dressing brides and bridal parties and planning weddings. We not only sell the dresses, but we tailor them too! We have a full service, in store, alterations department, ready to serve our customers with pride and a dedication to perfection that you will not find anywhere else. We have a passion for what we do and are excited to share our experiences and advice with you. If you have a question for our experts, please feel free to contact us directly. Are you getting married in Northwest Indiana? 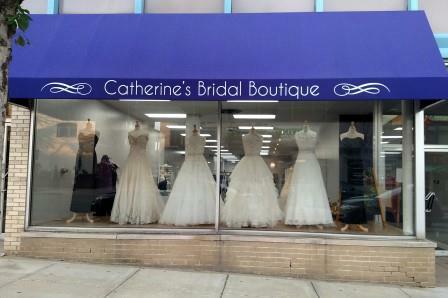 We hope that you will visit Catherine's Bridal Boutique during your planning process. We would love to help you find the perfect dress for you and your bridal party. We look forward to meeting you and exceeding your expectations.